Tokai Forum - a subsidiary of TokaiRegistry.com :: View topic - "SEVENTY SEVEN GUITARS"
Posted: Thu May 13, 2010 7:46 pm Post subject: "SEVENTY SEVEN GUITARS"
This new brand "Seventy Seven Guitars" look veeeeeeeery good to me! yes they do! but why would those stork standards have semi hollow back? One day I will have a chambered LP, and the Stork looks like it would fit the bill. It's Deviser so you can't go wrong there. The ES-335 (Exrubato) looks pretty good as well. i think they are very nice. इस खोज में भारतीयों का योगदान भी आगे.. There was this Jazz/Blues record company in UK before. Something with "77 guitars"? 77 Records was a British record label setup in 1957 by Doug Dobell, who used to run the famous Dobell's Jazz Record Shop at 77 Charing Cross Road, London. It specialised in folk, blues and jazz recordings. Artists that were recorded for the label or whose recordings were taken over from US-American labels included Ramblin' Jack Elliott, Alexis Korner, Lightnin' Hopkins, Scrapper Blackwell, Reverend Gary Davis, Robert Pete Williams, Big Joe Williams, Sunnyland Slim, Joe Turner, Freedom 77, Little Brother Montgomery, Yank Rachell, and Sleepy John Estes. I have a 77 Exrubato Standard!! Posted: Sat Jun 16, 2012 6:46 pm Post subject: Solid Top? Only a newbie here but love the craftmanship and unique qualities that the Japanese guitars possess. Just wondering if the Seventy Seven Stork FM has a solid flamed maple top, or is it a veneer? Posted: Mon Jun 18, 2012 8:07 am Post subject: Re: Solid Top? Body:Maple on African Mahogany (Semi-Hollow)"
Body:Flame Maple on African Mahogany (Semi-Hollow)"
The "H or S" appears to refer to humbuckers or P90 type pickups, the "FM" has to mean flame maple as this description has a picture of a flamey Stork next to it. So, it's not really definitive from the catalogue (thanks to my ability to read Japanese!) but I can also tell you that the Standard is 157K Yen and the FM is 189K Yen. Generally the Japanese catalogues say something if it is relevant, so personally I would expect the Stork models to all have solid tops. They know pretty much everything there is to know about Deviser guitars. I love the look of the Stork model, especially the relic one that I missed out on, and I'm determined that a Stork will be my next guitar buy. Posted: Tue Jun 19, 2012 2:04 am Post subject: Re: Solid Top? Posted: Tue Jun 19, 2012 9:03 am Post subject: Re: Solid Top? No worries mate, they're in Melbourne (although out in the sticks) and nice people as well. They have a very good relationship with Deviser and can even do some custom orders. 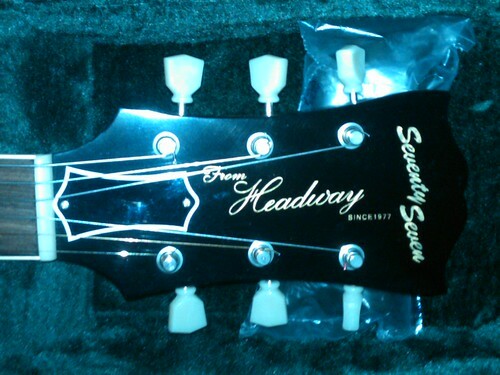 I also have the Seventy Seven Exrubato Hollow with P-90s, its essentially a Epiphone Casino. I really like it! Especially when playing a Beatles tune!